Giving men with testicular cancer a single dose of chemotherapy alongside radiotherapy could improve the effectiveness of treatment and reduce the risk of long-term side-effects, a new study has suggested. As many as 96% of men with testicular cancer now survive at least ten years from diagnosis, but more advanced forms need to be treated with combination chemotherapy – which can have serious long-term complications. Researchers at The Institute of Cancer Research, London, and The Royal Marsden NHS Foundation Trust have therefore been searching for new treatments that would reduce the risk of relapse after initial treatment and so spare as many men as possible from needing combination chemotherapy. Dr Robert Huddart, Team Leader in the Division of Radiation and Imaging at The Institute of Cancer Research, London, and Consultant at The Royal Marsden, who led the study, said: “The results of this study show great promise. Men who have this stage of testicular seminoma are normally treated with just radiotherapy, or in some countries with intensive combination chemotherapy, where several anticancer drugs are given at once. "Relapse occurs in 5-11% of men after radiotherapy alone, and these recurrences have to be treated with combination chemotherapy, which is associated with a risk of serious long-term complications such as cardiovascular disease or second cancers. The new pilot study tested a new treatment in a pilot study of men with stage IIA and IIB testicular seminoma – where the cancer has spread to the lymph nodes in the abdomen. The researchers showed that giving chemotherapy drug carboplatin before radiotherapy could reduce relapse rates compared with radiotherapy alone – cutting the numbers of men who would need follow-up treatment. It also allowed radiation doses to be reduced. The study was funded by The Institute of Cancer Research (ICR), the Bob Champion Cancer Trust and Cancer Research UK, as well as through the NIHR Biomedical Research Centre at The Royal Marsden and the ICR. Researchers gave 51 men with stage IIA and IIB testicular seminoma a single cycle of carboplatin – a low toxicity form of chemotherapy – followed three to four weeks later by radiotherapy. Most of the men were aged below 50, over a range of 18-73 years. 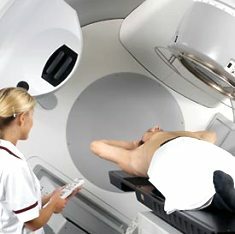 Adding carboplatin to patients’ treatment plans allowed doctors to give a lower dose of radiation over a smaller area of the body for most of the men in the study. Some 39 of the men in the study had their prescription of radiation reduced from the standard 35 Grays (Gy) of radiation to 30 Gy, delivered to a smaller area of the abdomen. After an average of 4.5 years of follow-up, there were no relapses of the cancer compared with a relapse risk of 5-11% after radiotherapy alone. The side-effects from treatment were mild and only lasted a short time.